warning: Invalid argument supplied for foreach() in /opt/drupal6/sites/all/modules/cck/content.module on line 1284. One of the highlights of the 2009 Intel ISEF was a visit by Conan O'Brien. He visited the exhibit hall during setup day and interviewed lots of people. They've finally posted some videos from those interviews and some Beaverton-Hillsboro Science Expo winners were featured prominently. Who knew we had comic geniuses as well as scientific ones? 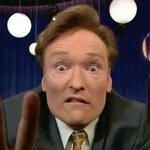 Check out the "Intel Science Fair, part 1" and "Intel Science Fair, part 2" videos here: http://www.tonightshowwithconanobrien.com/intel/. The adult sponsor must register first before adding projects. If you are starting your project over the summer, high school students need to visit http://www.societyforscience.org/isef/document/ for the 2010 rules and forms. The human subjects form has huge changes. Team Oregon came home with 15 Grand Awards and 11 Special Awards and scholarships, accumulating $237,000 total, from the Intel International Science and Engineering Fair held May 10-15 in Reno, Nevada. Society for Science and the Public, the organizer of Intel ISEF, estimates that 30% of projects win grand awards. Team Oregon came home with a success rate of 58% in grand awards. Every regional fair that sent students to Intel ISEF as members of Team Oregon was represented among the winners of awards this year. Team Oregon at Intel ISEF 2009 in Reno! 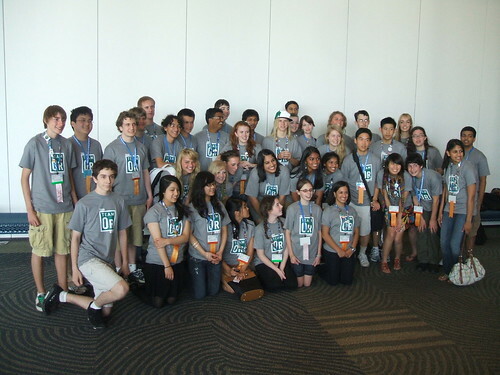 Check out the flickr photostream for Team Oregon at the 2009 Intel ISEF in Reno, Nevada. Interviews start Wednesday morning. Wish us luck! The 2009 competition will comprise of middle school students currently enrolled in the 6th, 7th, or 8th grade. The middle school grade competition will be a derivative of the current competition guidelines developed by Intel Northwest Science Expo (NWSE). The guidelines set forth by Intel NWSE were selected due to the familiarity and program awareness by Oregon Science Teachers. There are several changes for the 2009 science competition. In 2008, the competition was open to 4th, 5th, and 6th graders. In 2009, the science competition will be open to 6th, 7th, and 8th graders. The categories have also been expanded to cover more competitive categories. In addition, the science competition will be entirely open-class. There is no longer a requirement to roll-up from a county fair. More information (guidelines and forms) can be obtain online at www.oregonstatefair.org/competition/science. Thank you sponsors, teachers, parents, judges, volunteers, staff and students for a great science fair. Click on the title of this blog to reach the attached results. Peter Stott Center is located at 930 SW Hall, Portland 97201. All Middle School events are there. Smith Memorial Student Union is located at 1825 SW Broadway, Portland 97201. High School exhibits are on the 3rd floor. The high school award ceremony is in Hoffman Hall at 1833 SW 11th. All three locations are on the Portland State University Campus Map. Non-Judging Volunteer registration is open again, if you select a job, consider yourself assigned and check in at the Stott Center lobby. If you are doing a 7AM job at Smith report to the third floor there for check in. Please do not select overlapping job assignments. If you are a judge looking for project abstracts please sign in at affiliatedfairs.org. Click on the judge main menu and then the abstract button. Due to the Oregonian article we have more judges then ever before. All category judging spots have been filled. If you are a member of a local organization, sponsoring a special award, please register by noon on Monday otherwise we can not guarantee you a lunch. We do still need other volunteers for various jobs.